Those two words describe our engraved brass offerings. In addition to the pre-cut pieces shown here, American Nameplate daily produces dozens of brass plates, cut to size and engraved to your specifications. Our pricing is based on the square inch size of your product so you can 'have it your way'. There's no extra charge if you'd rather have a 2 1/4" x 3 3/4" piece or a 3" square. And we have brass available up to 12" wide by 24" high so whatever your need, we can likely meet it. Most customers choose satin finish brass, engraved so the letters are black, or black brass which provides letters in gold. Whatever your choice, we'll produce a work of art that will enhance your treasure. 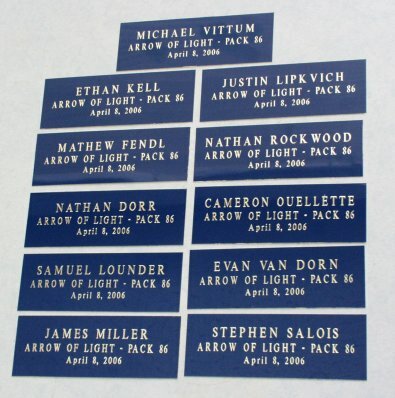 Imagine the pleaure these Cub Scouts will get when the receive their recognition with their name and the date engraved on BLUE brass. The gold letters look just fabulous and brass will last a lifetime. If you use screw holes, we provide the screws. In other cases, we'll place 3M™ Double-Sided Tape on it. This 'industrial strength' tape will provide a lasting seal for years to come. Click here if you're looking for metal namebadges! 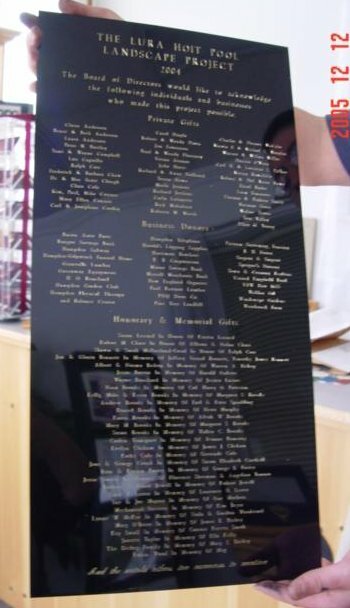 Black brass, engraved as a recognition of donors.